[By Nick] It looks like it’s about time to continue our trip to Stonyfield Farms. We all know I’m a fan of caramel so it was only a matter of time before I picked up their Crème Caramel froyo. 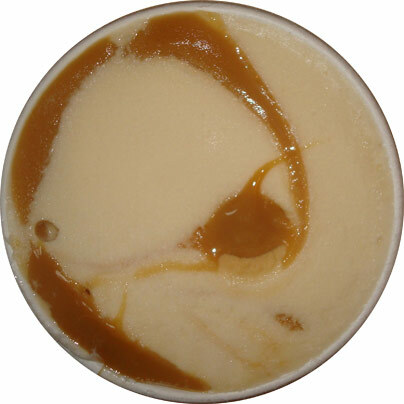 I mean, come on, it's caramel frozen yogurt with a caramel swirl. Caramel on caramel action is always a good thing in my book. Also, unlike its vanilla and java siblings this one is of the low fat nature instead of being nonfat. The packaging is pretty much the same with this one as it was with the vanilla. The only difference is that now the cow’s wearing a scarf. I don’t know why but I can’t stop smiling when I look at that cow. There’s just something about a cow in human clothing that just makes you happy inside. I also like the flowing caramel river going on at this farm. Hopefully it’ll be like that inside the pint as well. Gary is back on the pint and is saying that this is the perfect dessert for entertaining. I’m not one for being a dinner host so this one will have to be entertaining my taste buds instead. Okay let’s end this randomness and get to the product. Whoa, if that’s not an appealing caramel swirl then I don’t know what is. When I was removing the protective film, the caramel was clinging to it for dear life. I was impressed me with the amount of stretch it had. Scooping the base alone, it’s slightly creamier than their vanilla version but that’s to be expected since there is fat involved in this one. As for taste, it’s a real sweet caramel, and when I say sweet, I mean your dentist is already getting your fillings ready for you. It lacks any amount of the burnt qualities I prefer in caramel though. Without any burntness, this is just a very sweet base but still tolerable. As for the caramel swirl though, it somehow manages to be sweeter than the base. The only other difference in taste from the base is that the caramel swirl has a more buttery taste to it. To give you guys a better picture, imagine they took all the caramel from a few Simply Caramel Milky Way bars and dumped it all into this pint. Just like those Milky Way bars, this pint lacks any sort of add in to counteract all of the sweet caramel and becomes extremely unbalanced. There needs to be something to offset all of the sweetness the caramels produce. The addition of some dark chocolate chips or even chocolate covered pretzels would’ve gone a long way in saving this one. As is though, it is just by far way too sweet for my liking. I absolutely love Stonyfield's line of nonfat frozen yogurt. In fact, I am currently addicted to the chocolate after dark, gotta have vanilla, and gotta have java flavors, so I was excited when I saw you reviewed another Stonyfield product! 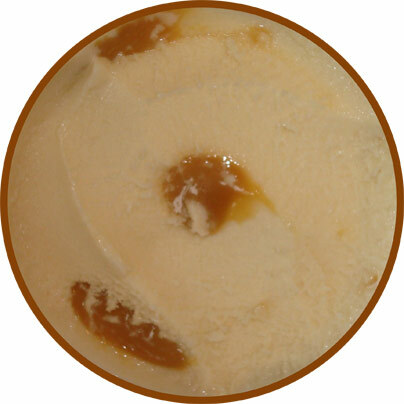 I had this caramel swirl once and it is extremely sweet and very caramelly. This is exactly how a caramel swirl dessert should be though. The finished product needs to match the name of the product and its description. For instance, Haagen Dazs gives way such a skimpy serving of caramel swirls in their ice cream flavors (not the Sea Salt gelato though) that it doesn't do the name on the consumer justice. 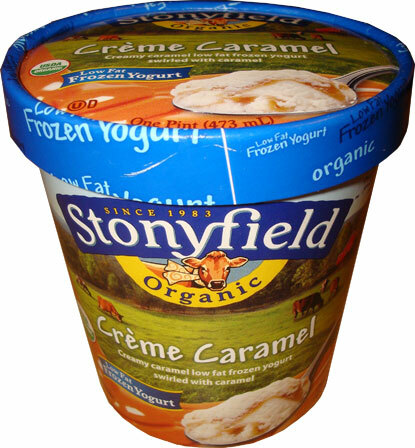 At least Stonyfield delivers the caramel swirl that it promises to provide. Furthermore, it's a healthier option than ice cream, and if you want added mix-ins then you can always add them yourself. Plus, by doing so, you have complete control over what you want to add and how much of it you want to add instead of having a company do it. In the end, depending on how much you add, it could still be a healthier option than ice cream. @Stride: I agree with you for the most part with the base flavors. With this one, you can't really add mix-ins since the swirl wouldn't be consistent enough for my liking. I like a straight base to add mix-ins to and I do use the normal base flavors for sundaes on occasion. My favorite stonyfield is their mint flavor which I should probably do a review of in the near future. @Sam: I just wish there was something to counteract the caramel. That or one of the caramels have a saltier tone to compliment one another and keep the sugar rush under control. I agree that a saltier swirl would be a nice touch. Maybe chocolate covered pretzels or potato chips? Now a part of me wonders if Stonyfield's Vanilla Fudge Swirl yogurt has as much fudge swirl as the caramel does in this one you reviewed. Maybe that is something you can review in the future. If there is as much fudge swirl I wonder if people would say there is too much fudge but I don't think there's such a thing as too much chocolate either. @Stride: I had the fudge swirl one a long time ago and while there's a lot of it, I wouldn't call it fudge. It's more along the lines of syrup. I haven't seen it around me in awhile but if I can find it again I'll be sure to do a review!